With the Pacific Ocean only 8 miles to the west, the Navy Golf Course Seal Beach has the feel of an ocean course. 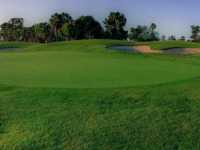 The course offers excellent Cypress golf deals on their 18 hole Destroyer course. They also have an executive facility for leisure golfers. This course is located in Cypress, Ca., approximately 7 miles from the Disneyland Resort. This is a military run facility available to the public. It was designed by Joe Williams and opened in 1966. The 18 hole Destroyer course is a par 72, covering 6,780 yards from the championship (blue) tees. The Navy Golf Course Seal Beach has a course rating of 72.8 with a slope of 129 on Bermuda grass. The course can best be described as a land mine course. Twelve holes are in direct contact with lakes. There are strategic sand traps guarding the greens. While the course is flat, you must be accurate off the tee. If you are looking for Cypress tee times, Navy Golf Course Seal Beach tee times must be made through the course starter with preference going to military personnel. Amenities include a full service practice area, rental clubs, cart rental, pro shop, and a restaurant/bar.